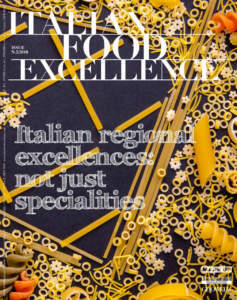 The ‘Terre di Siena DOP oil’ is characterized by a very fruity taste, with bitter and spicy notes, a light green tending to yellow colour, low acidity, up to 0.5% (in the organic version, the acidity is even lower and does not exceed 0.2%). As it happens for the best scents, the Terre di Siena DOP oil, too, has its endnotes, which in this case smell of dried fruit, green apple, artichoke, and tomato leaves. It is rigorously produced with olives directly picked from the tree not later than December 31st, stored in suitable cool and ventilated rooms for no more than three days from picking, and processed within twenty-four hours after their arrival in the oil mills. 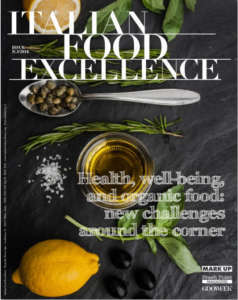 A so intense, but at the same time delicate oil, gives the utmost gastronomic satisfaction when used raw, in order to flavour salads and typical Tuscan soups prepared with beans, chickpeas, lentils. It is an essential ingredient on vegetable soups with bread, in cold pasta salads, and olive oil with pepper and salt in which raw vegetables are dipped. 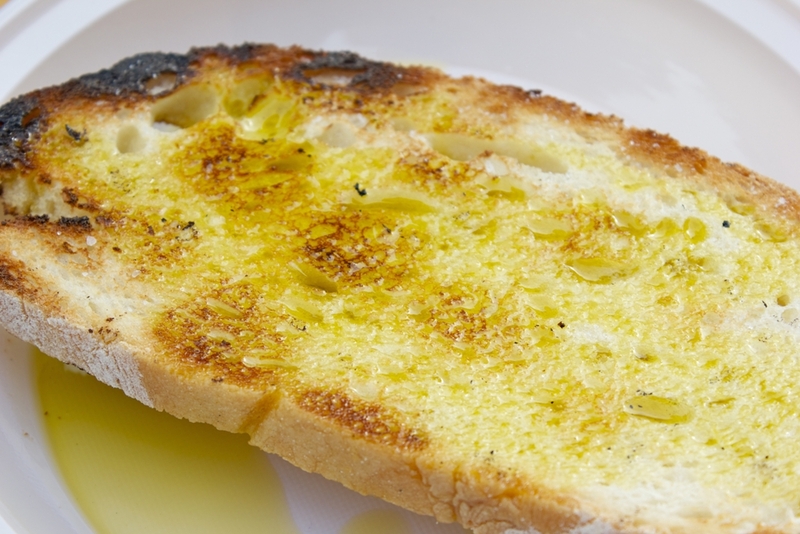 In order to taste and appreciate its full-body and refined flavour, the best way is on ‘bruschetta’, consisting in large slices of white bread, grilled and rubbed with fresh garlic, seasoned with abundant oil. the Yellow Route: south of Montalcino and the counterforts of Amiata in Val d'Orcia. For transporting olives to the oil mill, the use of sacks or bales is forbidden, in order to avoid overheating or fermentations. The olives must be processed within 24 hours after their arrival in the oil mills. The olives must be subjected to prolonged but gentle washing with pure water at room temperature. The preservation of olives in the mill never exceeds 72 hours and it happens in ventilated, custom-made rooms. 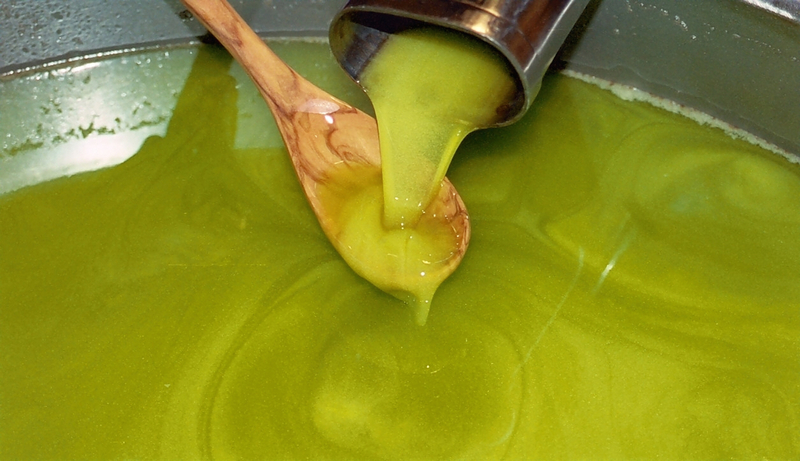 For extracting oil, mechanical processes only are allowed, so that this oil fully preserves the original characteristics of the olives with which it is produced. 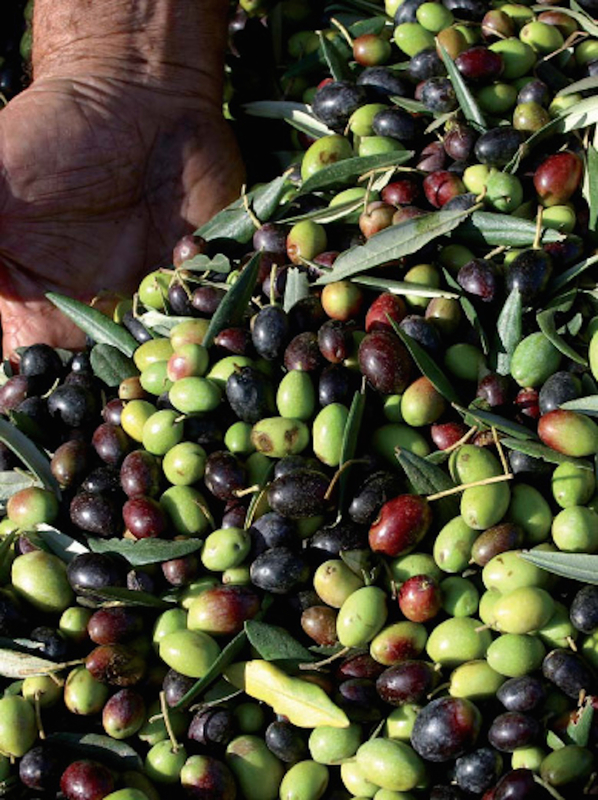 The yield in oil cannot exceed 22% in weight of the olives. The Consortium provided itself with rigorous external control bodies, just to preserve the uniqueness of this oil. 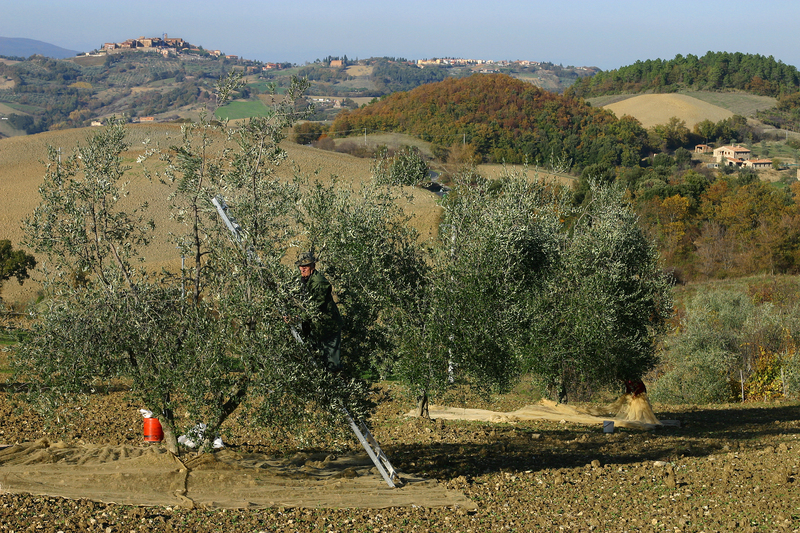 The olives assigned for the production of the Terre di Siena DOP oil must be produced in the hilly areas of the Province of Siena suited to the production of oil with the characteristics and quality level required by the production specifications. 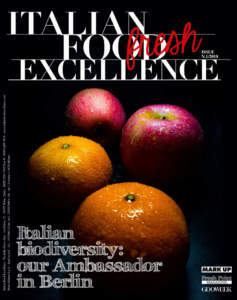 The Tuscan olive oil exported abroad exceeds 500 million Euros in value. As for the DOP oil of Siena, 70% is assigned abroad, particularly to the United States, followed by Germany, United Kingdom, Japan, Canada, but also China, Russia, and Brazil. In order to oppose the attempts of counterfeit, and avoid losing their own image, the producers of have invested a lot in packaging, using only highest quality glass and carefully following the design of their labels. In these packs, each image, colour, and graphic choice reminds the melancholic and rustic beauty of the countryside, in a pleasant stereotype of olive groves, country houses, endless views. 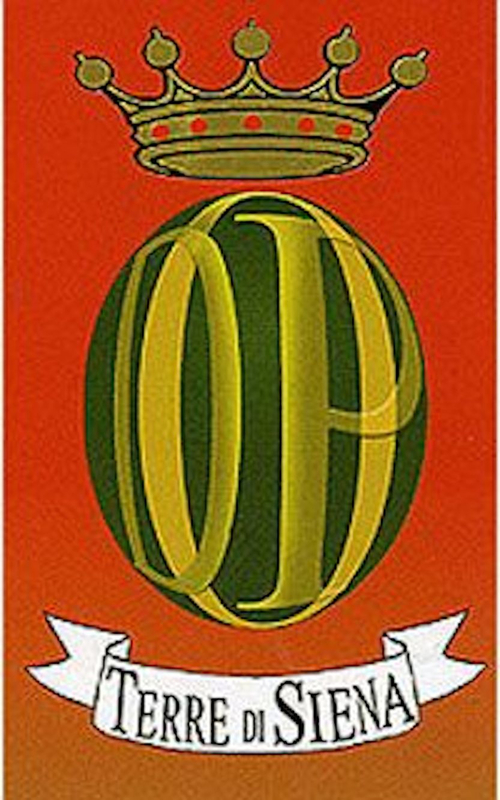 The logo of Terre di Siena DOP Extra Virgin Olive Oil consists in a mark represented by a rectangular red element, with a golden frame, which encloses a green oval, which represents an olive containing in it the writing 'DOP'. 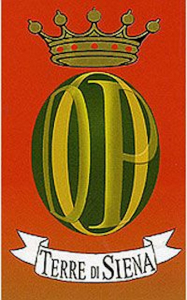 The oval green is surmounted by a crown with 5 points and below the oval there is the writing 'Terre di Siena'.